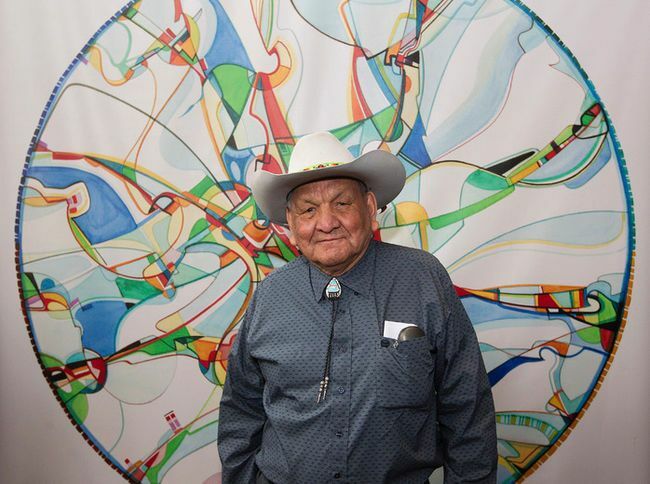 This major retrospective celebrates Alex Janvier’s 65-year career of creativity, knowledge and perspective, gained through his love of the land, art and Dene culture. Featuring more than 100 remarkable paintings and drawings from public and private collections across Canada, including well-known masterpieces as well as pieces that have never been on public display, it is the largest and most comprehensive retrospective on the artist to date. The artist’s unique paintings, with their vivid colours and calligraphic lines, combine Denesuline iconography with Western art styles and techniques, such as automatic painting and modernist abstraction. Exploring the geocultural landscape of Janvier’s northern Alberta home, his works on paper, canvas and linen reference Indigenous culture and history, including his own experience of the effects of colonization and residential schools, within a personal aesthetic that is universal in its appeal. Of Denesuline and Saulteaux descent, Alexandre Simeon Janvier was born in 1935 on the Le Goff Reserve in Alberta, where he had a traditional upbringing speaking the Dene language. At the age of eight, he became a pupil at the Blue Quills Indian Residential School, where he was encouraged to pursue art. For over 50 years, Janvier has devoted himself to the development of Indigenous art as an artist, activist, educator and government consultant. Celebrated and honoured on many occasions, in 2002, Janvier received a National Aboriginal Achievement Foundation Lifetime Achievement Award and he was made a Member of the Order of Canada in 2007. Janvier is a prolific artist. He has produced thousands of paintings and continues to paint in his home and studio in Cold Lake, Alberta. Art truly is a universal language that can communicate any idea, any feeling, of anyone, regardless of their social standing, their religious beliefs or the language they speak.